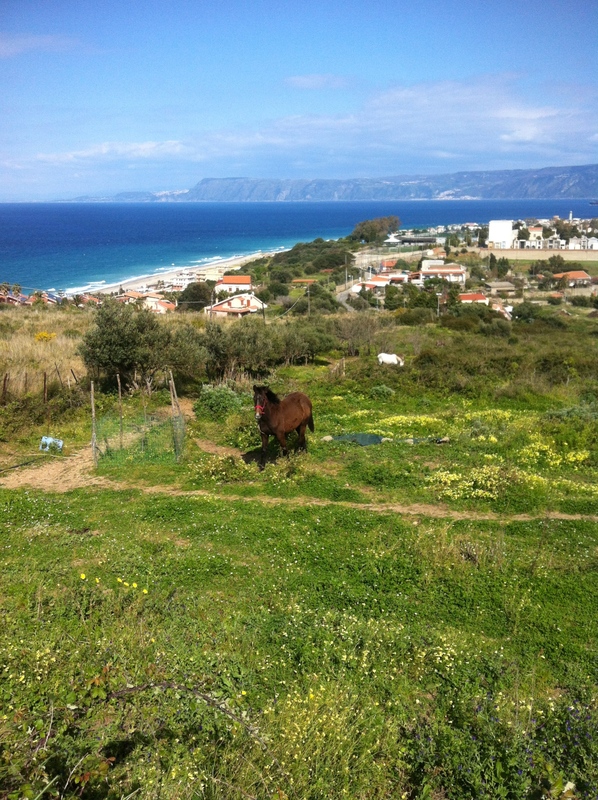 My time in Ganzirri, near Messina, Sicily, on the NE tip of the island, was sweet. 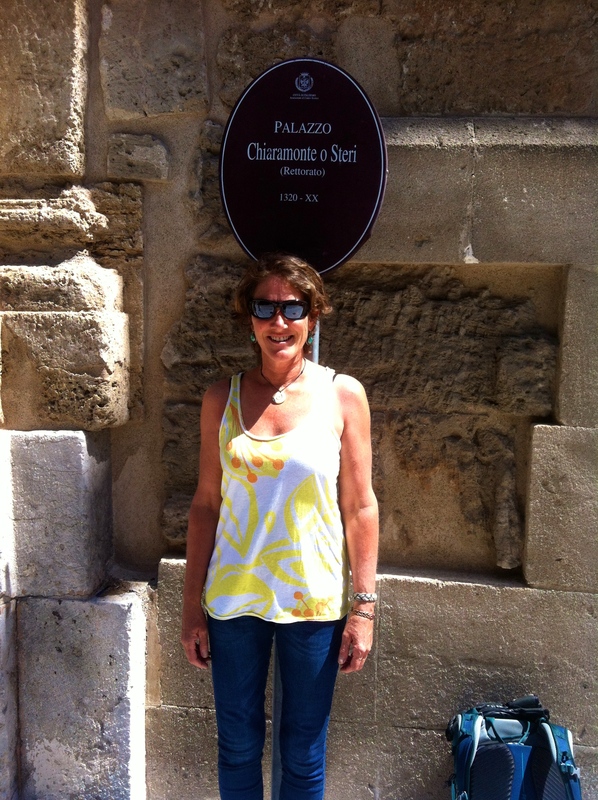 It was week 2 for me in Sicily. 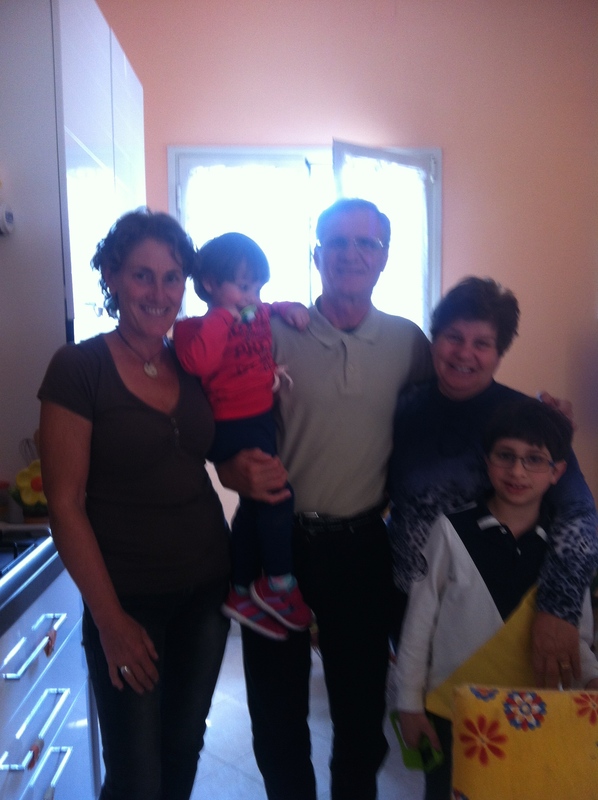 My hosts, Andrea and his mom, Nadia and dad, Luca, were all so kind and treated me as part of the family. 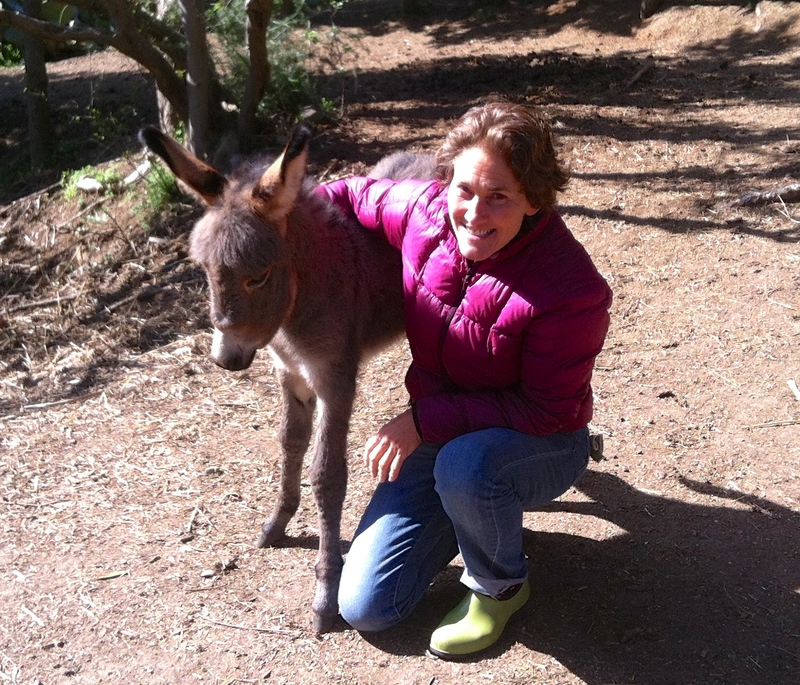 I spent the week playing with horses, donkeys, dogs, chickens and geese. Eating great meals with the family. Fresh eggs and an amazing assortment of cheeses at each meal. Nadia’s home baked bread and Andrea’s biscotti, Italian espresso in the morning and wine at night. Late nights up talking with Nadia. 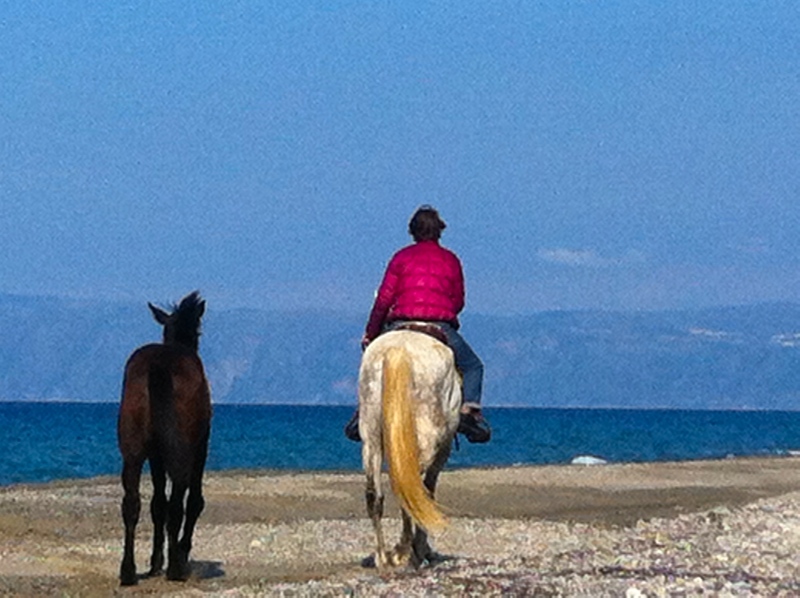 Two horse back rides on the beach below the farm with the foal following behind me, totally free. Panoramic views of the Mediterranean, Faro Straight, and mainland Italy below. It was a week to be remembered! 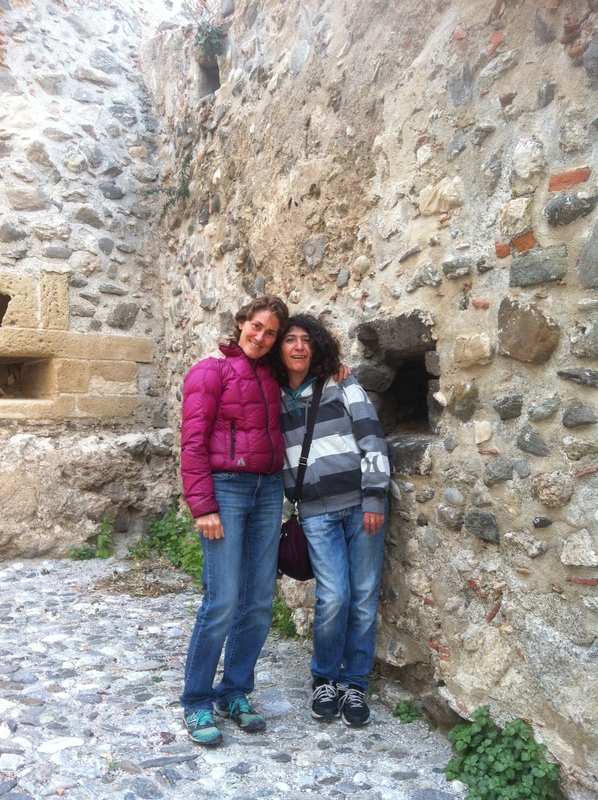 Two day-trips, one to Milazzo to the west, with Nadia and her mom to tour a castle and see the sunset at the end of the peninsula. Nadia’s mom ran into a friend who sells his wares near her shop. Abu, from Senegal calls her his Italian mom. So cool to see this unlikely pair embracing and to hear him speak fluent Italian. 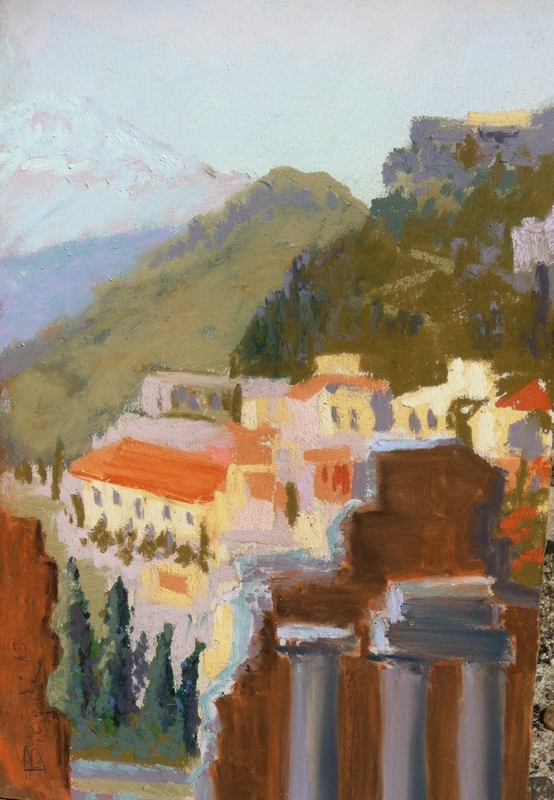 Another trip, solo, to Taormina to see the ancient amphitheater ruins where I painted for a couple of hours. Friends were made here in Ganzirri…deep connections that will never be forgotten. Nadia expressed her sadness of my impending departure many times. “Why do you have to leave me?” Tears welled up when I left. 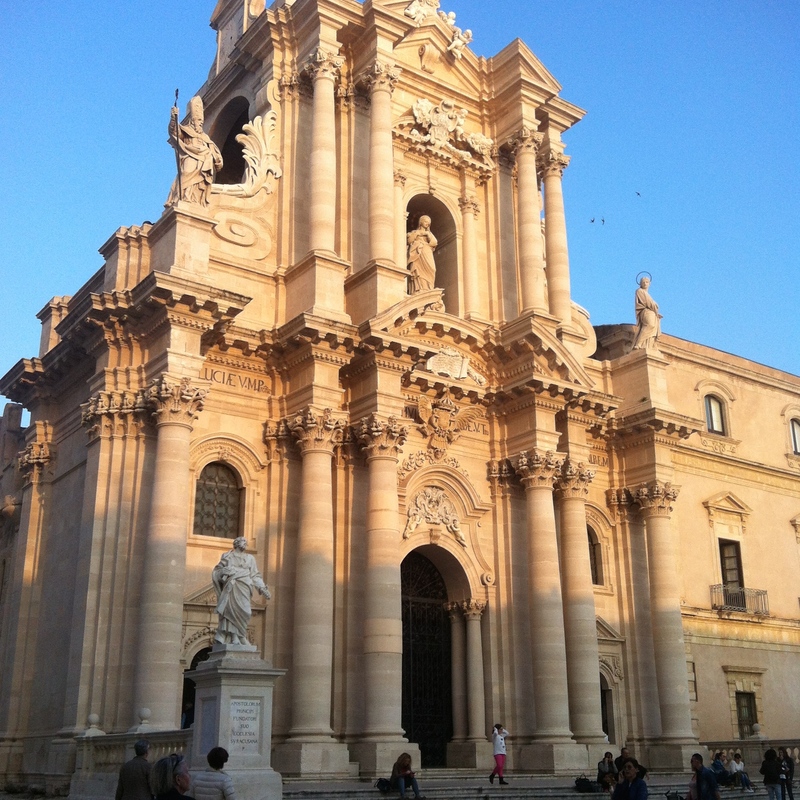 Finally, I jumped the train, then bus connection to Siracusa to the land of my ancestors and to see more ruins. My bus stopped in Priolo, where my grandfather was raised but I decided to go onto Siracusa since I was told there is so much to see there, my time was short, and Priolo has been overtaken by oil refineries. I was happy to be there, at least, and see the center of town. While on the bus I got “talking” to a man in front of me who spoke perfect Italian, (not a word of English). We passed my iPhone back and forth translating on Google Translate! Thank God for Google! He was trying to invite me to his house for lunch and kept motioning to his ring finger…then finally showed me a picture of his wife on his phone, “Lidia”. Ok, sounds safe enough. (One would generally think this was a man with ulterior motives…but when traveling, one’s sense of danger vs. genuine hospitality becomes more acute). 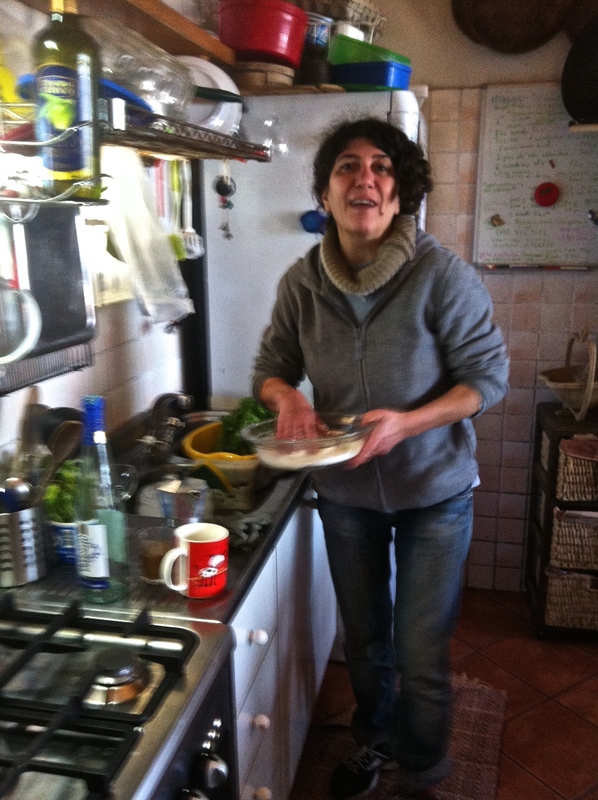 Antonio finally convinced me that he did in fact have a wife and that she would be home to cook us all lunch. 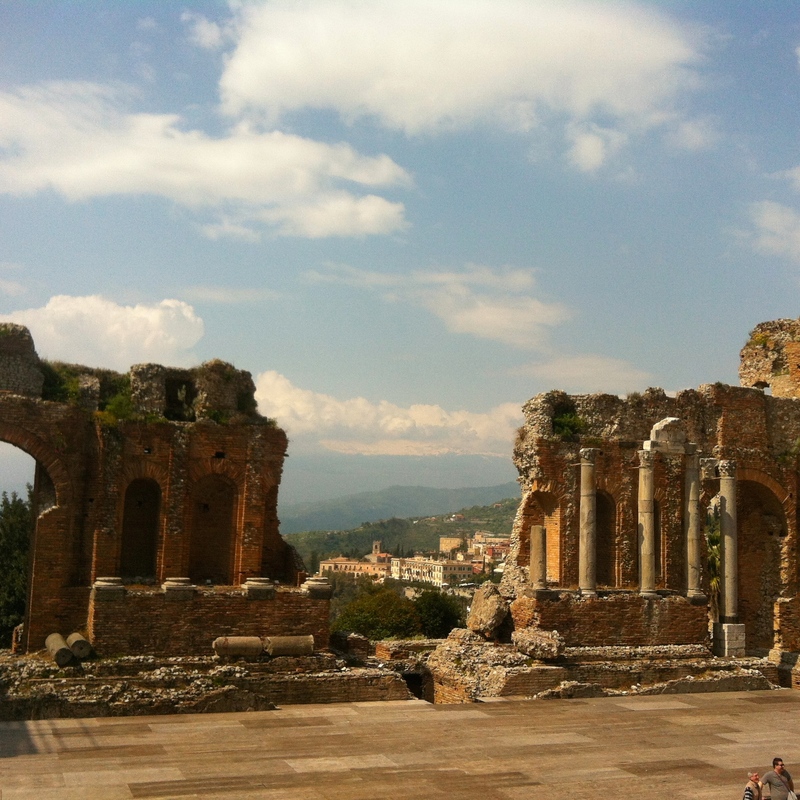 I wanted to get to the city to see the ruins as I only had the afternoon and next morning there….but I took the chance to be invited into a Sicilian family home and commune with the locals! I got off at his stop and walked to his car where we then picked up Lidia and went to their home, a simple cement house adorned with many photos of their two girls and grandchildren. The place was musty and closed up and they opened windows and got lunch going…pasta with mussels, olives, tomatoes, some sort of thinly sliced meat, lightly grilled (I was praying it wasn’t horse meat, as I have learned that they eat horse meat often!) Then cream puffs filled with chocolate and cake besides! I brought the cake with me, as by then I was stuffed. The phone rang and it was a daughter. They put me on the phone to speak English with her. They delighted in the novelty of the interaction 🙂 Soon after, the daughter and grandkids showed up and we talked some more, took pictures and played on the bikes outside. I wasn’t sure I would make it to the ruins today, but what the heck. We finally loaded into the car, Antonio, Lidia and the 2 yr old they were baby-sitting for the afternoon. It was interesting how they put the baby carseat in the back but put the kid on the seat next to it?! Not too safety conscious here! But at least I’m not seeing babies on motorcycles like in Dominican Republic! Well, only once! They drove me to my hostel to drop my bags, stopping a couple of times to show me the ruins from a distant. Since there was an entrance fee and gates were closing soon I decided to walk over the bridge to Ortigia instead, a UNESCO site where I saw the ruins of the Temple of Apollo, the most ancient Greek temple of Sicily, and second oldest in the world, dating back to 700 BC (!!) and other amazing sights like the Piazza Duomo and Cathedral, a church with a Baroque facade integrated into an old Greek temple where you could see the old columns exposed. I unfortunately didn’t plan well enough ahead and missed out on seeing the Archeological Park area the next day because bus connections for my travel to Agrigento were earlier in the day than I originally thought. A reason to come back someday! 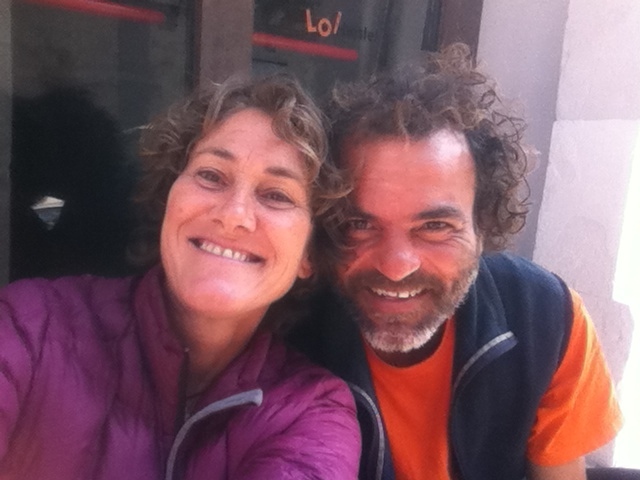 I had an unexpected and delightful encounter with a man named Juanjo from the Canary Islands, a kindred spirit, a traveler who gives a new meaning to the word “traveler”, having been on the road for 4 years, India twice, and so many other places, doing work exchanges and sometimes working for money. He is a perfect example of one who trusts in the Universe, knowing he will always be cared for. I was down by the sea watching the setting sun with many others, our paths crossed and we said hello…friendly large brown eyes, a lingering look and a HUGE smile. He looked different than the Sicilians. I wondered where he was from. Our paths crossed two more times in the coarse of an hour…and finally we began to talk…first with my very minimal Italian, then he asked if I spoke Spanish…”un poco”. I tried, but that didn’t work too well either! “English?” YES! Ok, now we were communicating more effectively. We walked the streets into the evening and sat on the steps of my hostel and shared what little food we both carried. Avocado’s, apple… he smashed some almonds with a stone and handed me the nuts. 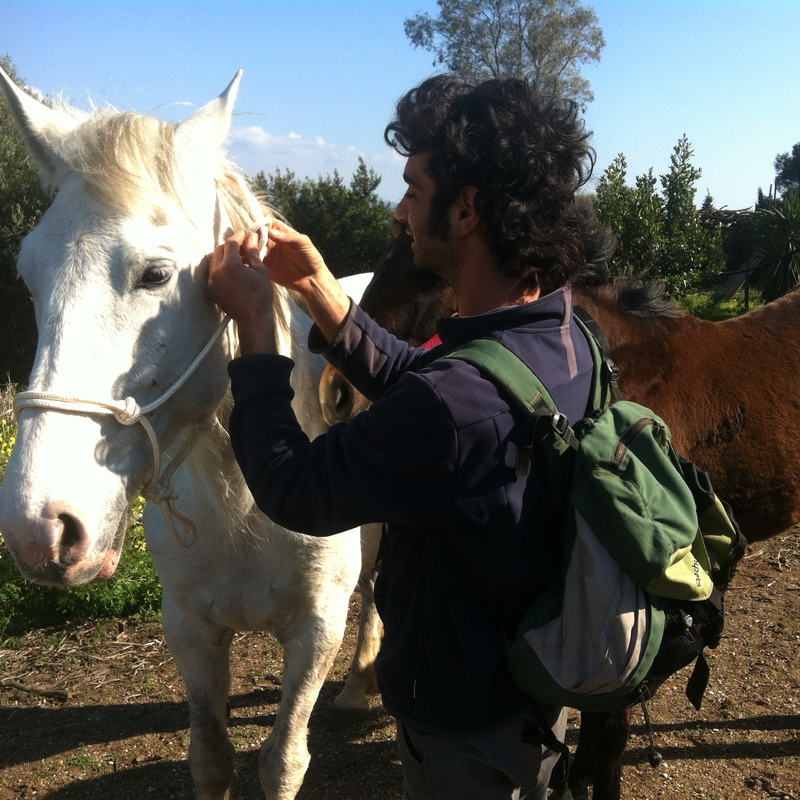 Juanjo the wild traveling man! I shared pictures of my life back home from my computer screen. Next morning we met and walked some more and then said our goodbyes….so much shared in little time…life of travelers…chance meetings of kindred souls….parting ways all too soon. It was a special connection…one you don’t come across everyday in the chaos of the city. I’m so thankful for those connections. It makes this traveling life so meaningful for me. I waved goodbye from the bus, Juanjo standing and watching me as I left…I had a feeling our paths would cross again someday. I landed in Catania at the train station and met up with Angelo, my former host, so that I could give him a small painting I did for him of his German Shepherd, Asia. He was thankful to receive it and brought me to a small cafe for a quick lunch then off to hop the bus to Agrigento on the southern coast. 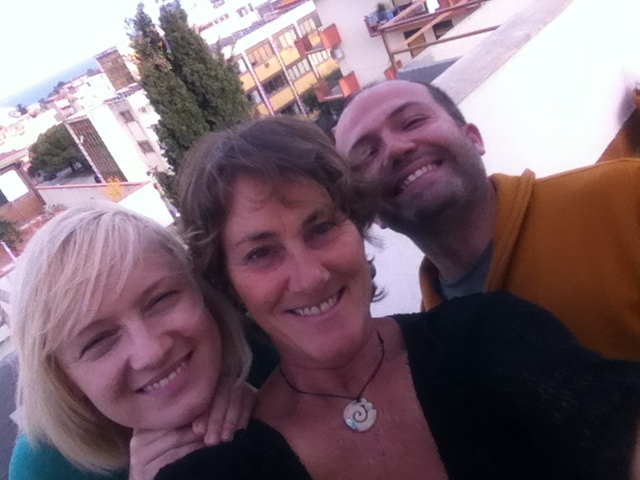 I was on my way to my third work exchange destination in Sciacca, where I was greeted by my new hosts, Aga and Alessandro. Alessandro’s family owns a “small” olive farm (500 trees!!) and he runs the show. He is a chemist by trade and has a small business making and selling health and beauty products he makes with the olive oil, besides the bottled oil as a food product. His girlfriend, Aga, from Poland, runs a language school in town. She invited me to come to do a week exchange and said she had a two day “project” she needed my help with. As it turned out, the English teacher had to leave for two days so Aga invited me to put together a presentation to give to 8 English classes so the students could hear another native English speaker and see how others might live. I put together photos of my life back home with family, pets, hobbies, artwork and described my current work and travel experiences. The students were to write a short article about me for homework! Several wanted to sign up to be my travel companion! 🙂 It was a great experience to share my stories and life with these people, ages 15 to 50, all so eager to learn English and interested and curious about my life. And fun to watch Aga and see how proud she is of her students, delighting in their diligent attempts to communicate with me. I was exhausted after 4 hours of talking each day, sometimes with only a few minutes between classes. But it was a fulfilling experience and very fulfilling. I also worked in the garden back at the farm, clearing weeds, rototilling and planting vegetables. With Accursio on our way to Santa Ninfa! After some time on the main highway we wound our way up to the village. 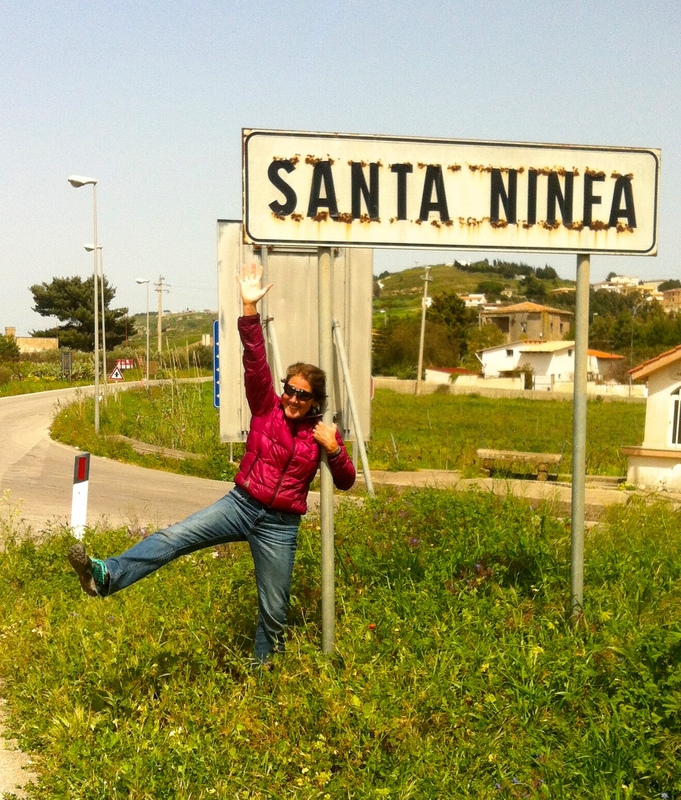 This was a dream come true for me, the biggest goal of my trip to Sicily, as I have been hearing the name Santa Ninfa all of my life, from my parents. Accursio was enjoying being my tour guide as much as I was enjoying the chance to find possible relatives. We stopped at a cafe and he inquired with some local old men sitting at the “Las Vegas” cafe and bar. Classic! 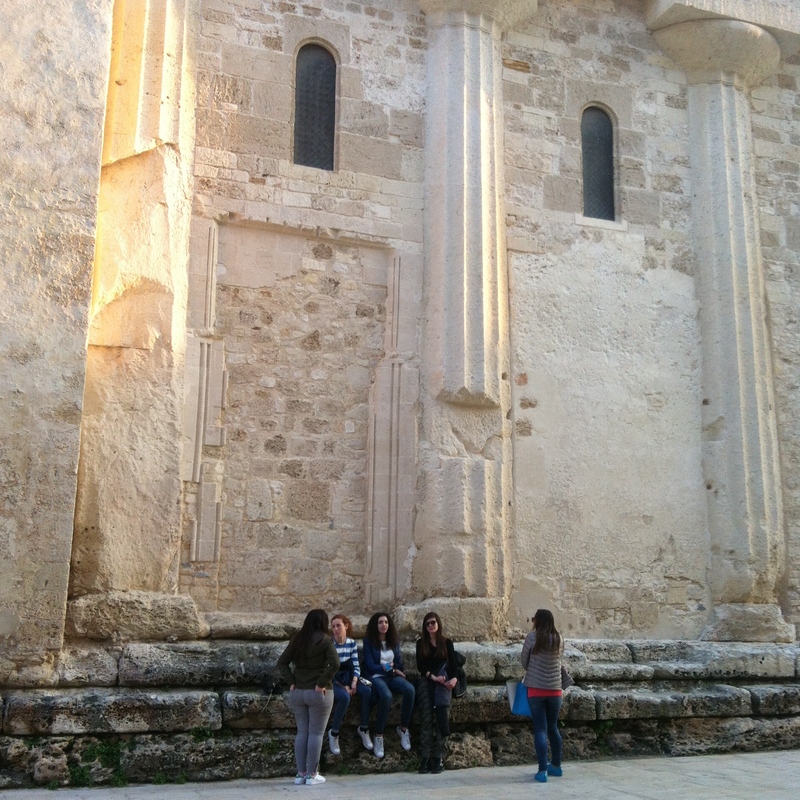 In Santa Ninfa, conversing with the old guys! They were all so interested in my mission and one man made a phone call and before we knew it, a man came walking across the street and introduced himself as Vittorio Chiaramonte! Accursio translated for me and we wrote out our family trees as best we could. Not sure..perhaps a distant cousin? So many Chiaramonte’s. 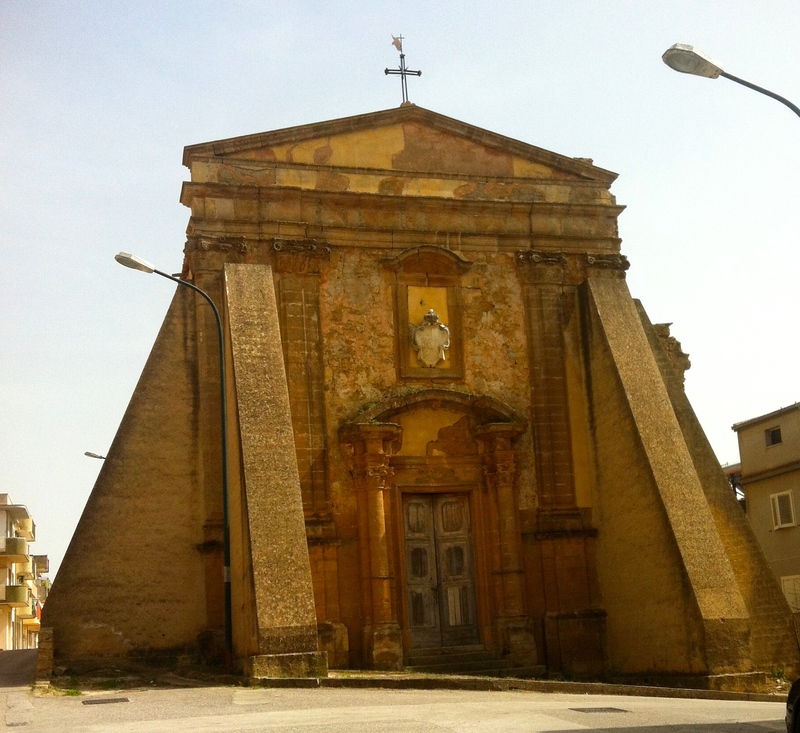 In fact, I learned that the famous Chiaramonte lineage, the Royal Chiaramonte family was the wealthiest family in all of Sicily. My cousin just informed me that we are probably not of that lineage. It was a nice fantasy! Possibly my great grandmother’s church! Accursio invited me and my hosts to his house for a dinner of calamari with red sauce, wine and dessert and Fennel liquor, all made by Accursio. Lots of sharing and laughter. 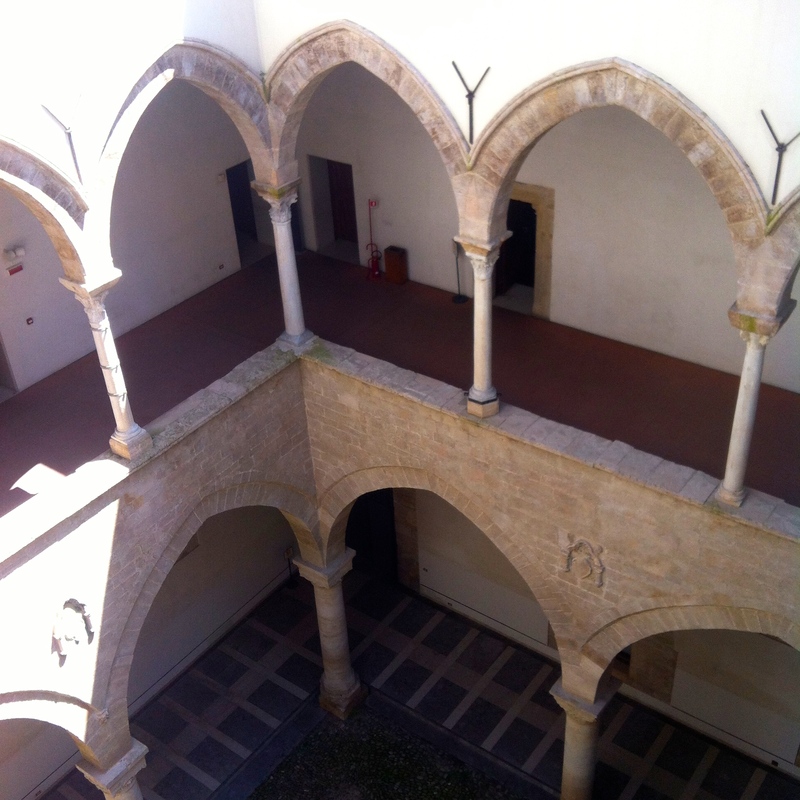 The next day he offered to bring me to Palermo and toured me around the city and the Chiaramonte Castle! In front of “my” Castle! I came to Palermo to meet up again with Juanjo from Canary Islands, as he was flying out to Madrid and we both thought it would be fun to spend more time together. 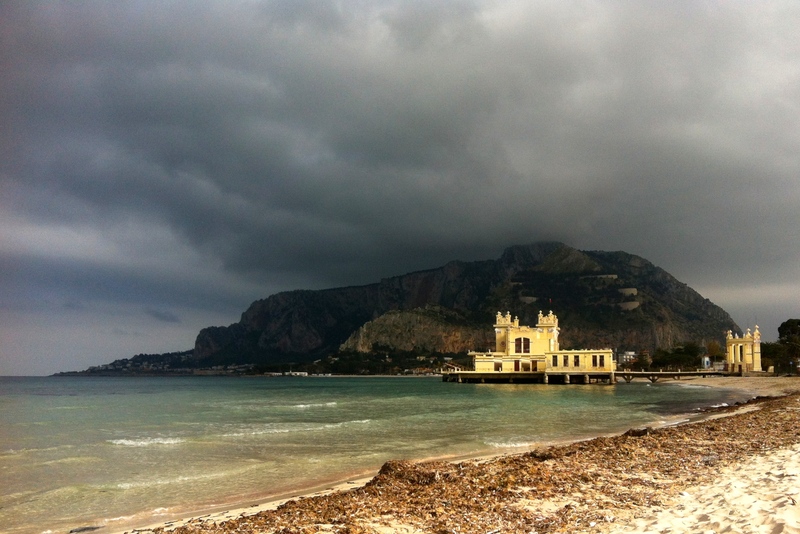 We toured the city and coastal town of Mondello, a scenic beach area. I did a painting from the beach and swam in the crystal clear FREEZING cold water! Deceiving, as it looks so tropical! Fun to hang out with him again, a funny and playful person on a spiritual journey through life. Much was learned from this traveler about simplicity and other ways of “doing life”. 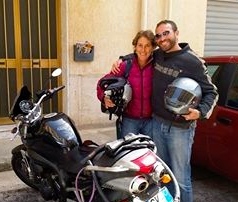 Today I visit the ancient Greek ruins in Agrigento, going by moto again with Accursio, my personal tour guide! 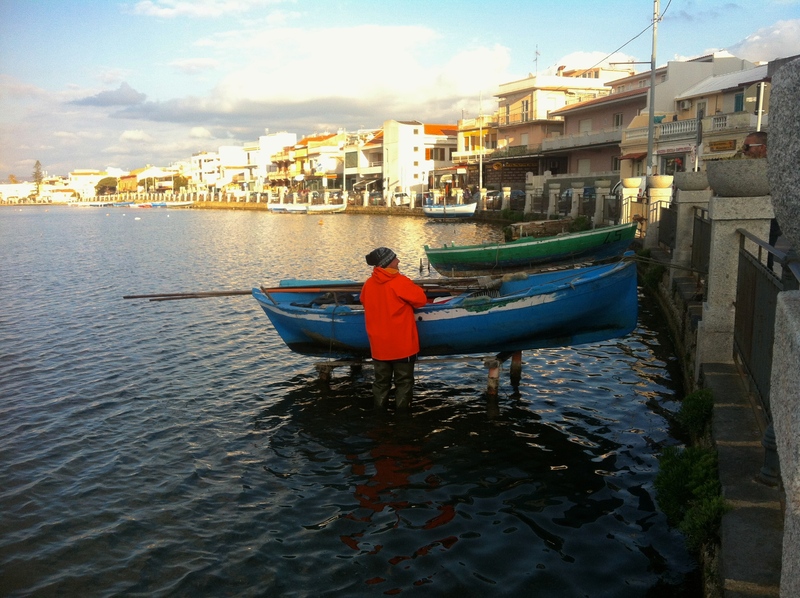 Stand by for pics of this next adventure….Agrigento and a spontaneous voyage at sea! What an amazing connection to your ancestors (so cool)…and more travelers. Your hosts sound like such interesting people…and fun food too! 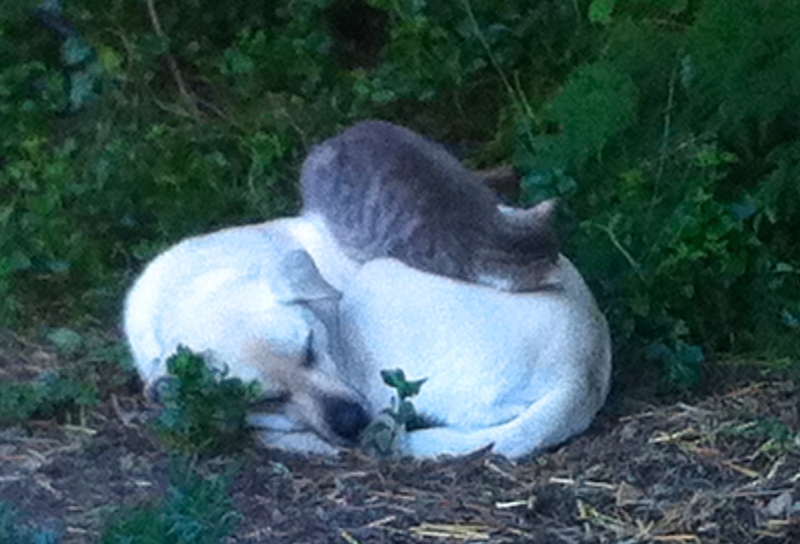 But it looks rather chilly…very pic you are wearing your down jacket! Love the blog! Happy travels! 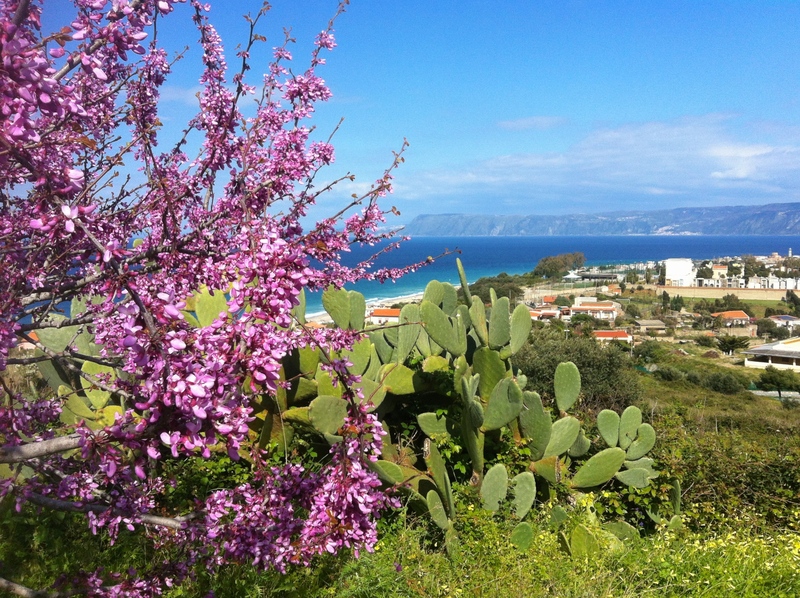 Yes, the weather in Italy has been unseasonably cool…they had a long cold and rainy winter in Sicily…but spring has sprung now and the temps are better. 70’s somedays. Was glad to have my lightweight down. The air here is similar to the Bay Area really. Cool and crisp. Same latitude as San Francisco with similar vegetation. Amazing journey…the universe always provides if you ask! Nice to share and have you along Bebe! Someday we will go together! Hi Wende! Thanks for your input. It’s nice to hear from friends back home 🙂 See you in September! I always wanted to visit Italy and with you as guide, marvelous! I’m enjoying the blog so much! Cool Jack! Glad to hear! I have a limited time offer: you pay only half price for my next trip and let me do all the walking, talking and eating for you!!! Fabulous! I miss Italy so much. Have you seen the Giro bike race? ← BUONA PASQUA/HAPPY BIRTHDAY TESSA and Northeast to Ganzirri!